For work related reasons, I opened a textbook on one of my undergraduate study topic: differential geometry (note: elementary level). When I was revisiting B-spline curve, I suddenly remembered a drawing activity that possessed the mind of me of 11 years of age: By repeating drawing straight lines from a point on one edge to another across the corner of the graph paper, amazingly beautiful curve suddenly appears. This is actually the graphical demonstration of de Casteljau's algorithm to evaluate a point on a quadratic Bézier curve as in the left graph of the above image. The right graph is cubic Bézier curve that could not be quite comprehended by the brain of 11 years old without proper guidance. And of course, no equation or symbolization was involved either. Anyways, I just thought it's cool if I could show elementary school kids how to play with math through those simple drawings. 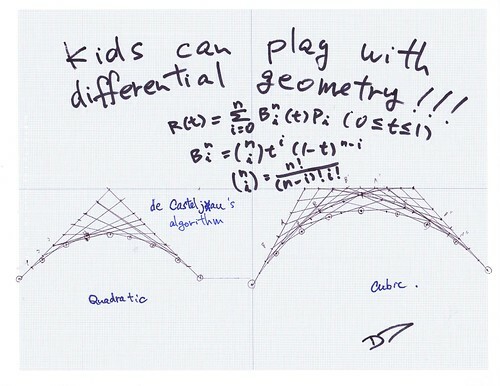 That may become a cause for growing future car designers, Pixar movie directors, or even great mathematicians.